This is London's most average bus stop, geographically speaking. It's on Lambeth Palace Road, between St Thomas' Hospital and Lambeth Palace. It's served by northbound buses on routes 77, 507 and C10. It's just across the River Thames from the Houses of Parliament. If you take the location of every London bus stop, then average out all the x-coordinates and all the y-coordinates, this is where you end up. As central London goes, it's pretty damned central. 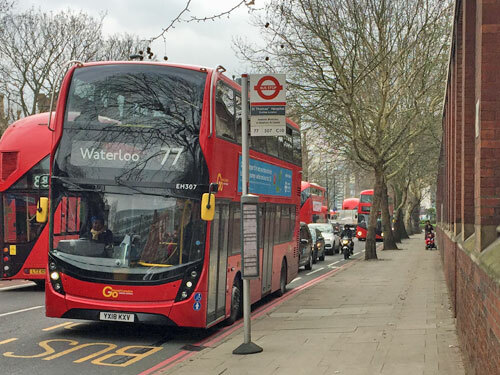 There's a good reason for this, which is that bus stops are fairly evenly distributed across the capital, buses being the go-everywhere means of public transport. And I'm fairly confident this is the right spot because TfL recently released a database of all London bus stops and their GPS coordinates. I've had some fun with previous versions of this spreadsheet, but this time I thought I'd calculate the average location. I disregarded bus stands, hail and ride sections and other superfluous data, and juggled the remaining sixteen thousand grid references, ending up with 530630 east and 179351 north. So that's interesting. Even better, the FoI request which released this information also included a separate datafile for the official locations of tube stations and other TfL modes of transport. So let's have some fun with that. This one might surprise you, because it's not in central London. If you average out the locations of all 270 tube stations you end up in Zone 2, a mile beyond the Circle line, roughly halfway between St John's Wood and Swiss Cottage stations. The precise point is bang on the boundary between Westminster and Camden, further north than Regent's Park, a bit to the west of Primrose Hill. Intriguingly it's very close to the disused tube station at Marlborough Road, but we can't count that because it's been closed for 80 years so it's not in the dataset. And the reason for this out-of-town location is that London's tube stations have a distinct north and west London slant. A paltry number of tube stations exist south of the river, as most people know, plus there are also relatively few tube stations out east. Meanwhile six different tube lines serve the suburbs of northwest London, with the legacy of Metro-land yanking the centre of gravity further towards stations in Herts and Bucks. Few things confirm the tube's geographical bias more clearly than its average station being St John's Wood. Whereas this is entirely appropriate. The DLR network is essentially a long east/west axis from the City to the Royal Docks, plus two links north to Stratford and one south to Lewisham. Its geographical centre turns out to be on the central connection between Poplar and Canning Town, close to East India Dock Basin, thus in an area that could justifiably be called Docklands. The precise spot on the Thames waterfront is marked by the Virginia Quay Settlers Monument, commemorating Britons who set out from Blackwall Quay to establish a colony at Jamestown in 1607, which makes for a nice historical bonus. Although the Overground notionally covers the capital, the wholesale takeover of West Anglia suburban services has yanked its centre of gravity firmly northeast. Before 2015 the network's geographical centre would have been close to Great Portland Street station, balanced out by branches to Watford, Richmond and West Croydon, but the abundance of fresh stations up the Lea Valley has changed all that. The new average location is a direct hit on Caledonian Road & Barnsbury station, appropriately part of the Overground's original loop, and will likely remain here until the Mayor acquires control of further commuter lines elsewhere. Confirming that the tram network properly serves Croydon, its most central stop turns out to be West Croydon. The central loop is perfectly balanced, east/west, by the line out to Wimbledon and the three eastern branches. But the average point ends up being slightly north of that loop because Wimbledon and Beckenham are significantly north of Croydon, and the New Addington branch doesn't have enough stops to even things out. This time I've turned to geospatial data provided by the ORR and numbercrunched over 300 stations in London with a National Rail service. And this time we've ended up inside a triangle bounded by Waterloo, Elephant & Castle and Vauxhall stations - closest to the latter. We're about half a mile from London's most average bus stop, but deeper into south London, which is only fair. If the tube network is better north of the Thames then the rail network is better south, reflecting the importance of non-TfL travel across this part of the capital. Let me circle those last five average stations on a tube map - the tube in red, National Rail in blue, DLR light blue, Overground orange and tram light green. 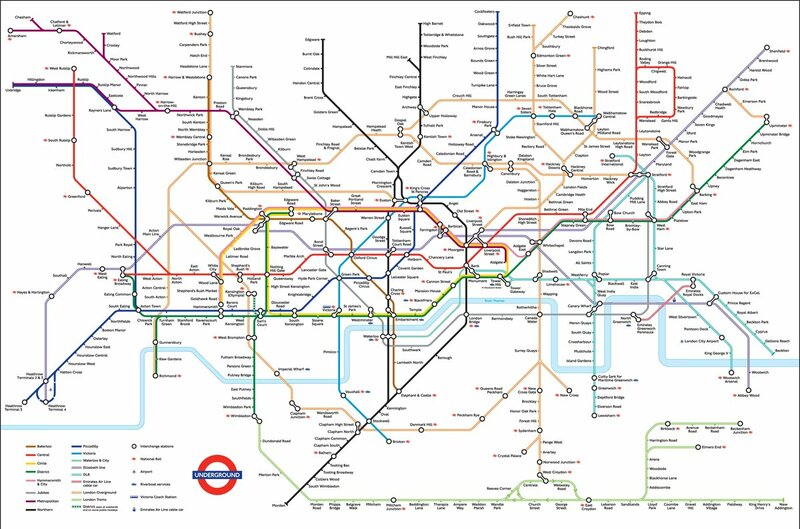 You might now be thinking "ah yes, now I understand why it's located there", but equally you might not because the tube map is a famously poor representation of geographical truth. The averaged-out location of publicly served river piers falls within St James's Park, conveniently close to Westminster Pier. ...but if and when Crossrail is finally complete, all those extra stations out towards Reading will be enough to overwhelm the shorter Abbey Wood branch, leaving the network's central point just west of Paddington.